Thanks to the efforts of early childhood literacy programs, more and more parents are realizing the importance of reading to their children starting at birth. Equally important, however, are initiatives to keep adolescents reading and gaining literacy skills so they can become productive, successful adults. To that end, the Young Adult Library Services Association’s annual Teen Read Week encourages teens to be regular readers and library users. The 2018 theme, “It's Written in the Stars: READ,” is designed to encourage teens to think and read outside of the box, as well as seek out fantasy, science fiction and other out-of-this- world reads during Teen Read Week, Oct. 7-13. Kicking off Teen Read Week at the Public Library of Cincinnati is a visit by young adult author Aisha Saeed at 7 p.m. Monday, Oct. 8, at the Main Library. Saeed is the author of several books for young people, including her well-praised Written in the Stars, and is also a founding member of the nonprofit We Need Diverse BooksTM. Besides Saeed’s visit, the Library has plenty of other fun Teen Read Week events, including a writing workshop with Library Foundation Writer-in-Residence Emma Carslon Berne. 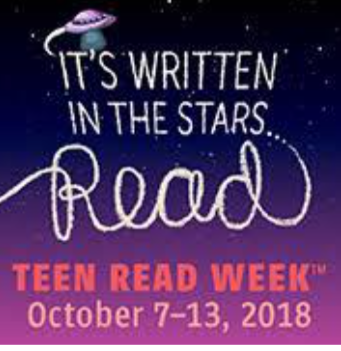 For a complete list of Teen Read Week events, go to https://cinlib.org/2M3W2SW or call 513-369-6900. The Public Library of Cincinnati and Hamilton County is one of the oldest, largest, and busiest libraries in the United States, serving a population of over 800,000 with a collection of more than 9 million items. In support of its mission of connecting people with the world of ideas and information, the Library also offers a wide variety of services and more than 20,000 free programs each year.